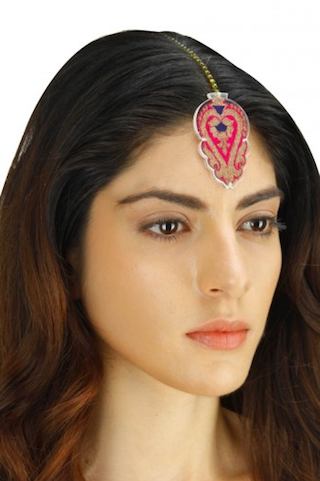 8 Pretty Jewellery Pieces *Perfect* For Your Mehendi! Your mehendi function is that one event when you can experiment with colours, props, outfits and decor. Almost everything! From the bright shamiyana to the genda flowers background, there is an outburst of vibrancy around you! Keeping all this in mind, you can push your style quotient too. Pick a bright outfit and some funky mehendi jewellery to go with it in place of the traditional floral jewellery that most brides put on! Here are some options for you to choose from! 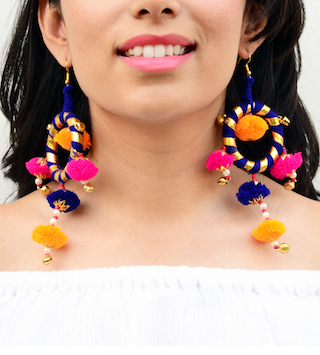 Adorn your ears with these bright, playful pom-pom earrings and you can forget about the rest of the jewellery. They are lightweight and with the gota ribbon all around, there is a lot of shine too! Choose from all the other colours available to suit your needs and your outfits! Price: Rs 599. Buy it here. This elaborate mathapatti looks beautiful from every angle, the top view is the best though. The fabric-embroidered patches sweetly chained together with all the other details definitely spells quirk in the right manner. Wear this with contrasting clothes for the best effect! Price: Rs 2,700. Buy it here. 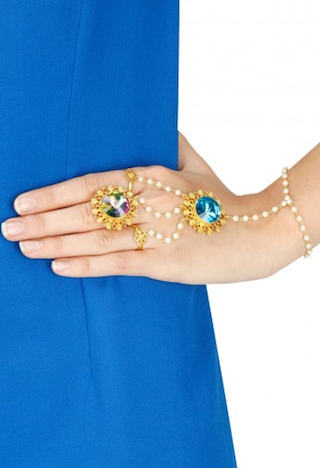 Once your mehendi is a bit dry, put on this shiny hand chain to add some more glam to your outfit! It will look great in photographs sitting there on top of your mehendi-ed hands! The sheen on the stones will make your eyes twinkle. Price: Rs 5,500 for a pair. Buy them here. 4. The Statement Embroidered Ring! Putting on a ring after the mehendi seems like a doable plan since it only takes over a small portion of the hand. This gorgeous and bold embroidered ring will truly stand out for the right reasons! Price: Rs 2,695. Buy it here. Go a bit unconventional and wear a maangtika that is made out of a brocade fabric patch. It’s innovative and defines the face gracefully. The tiny green beads add more finesse to the head gear and will definitely grab some eyeballs. Price: Rs 5,500. Buy it here. If you’re going for a hairstyle that pushes your hair to the back, don’t stay away from highlighting the ears. 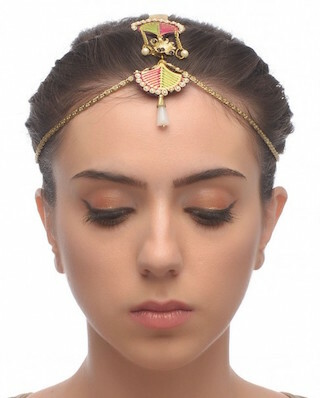 This floral ear cuff along with the raindrop pearls will do exactly that and is so desi yet so modern! Price: Rs 4,300. Buy it here. 7. The Hand Cuff With Mukaish! 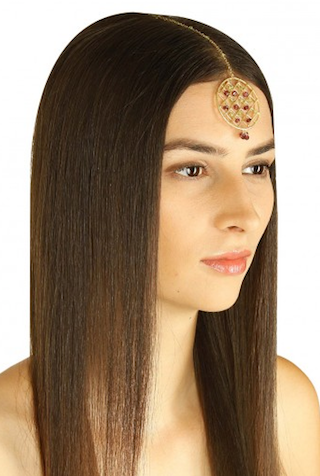 Slip this mukaish embroidered hand cuff on, of course, after the mehendi has dried a bit. The tiny pearls on the edges and the decorative pinks and mauves all around look elegant and artsy at the same time! Price: Rs 3,500. Buy it here. If you’re someone who doesn’t like too many complications around your jewellery, this should be your pick. The circle is distinct, the mesh along with the tiny stones looks festive. This is a great option if you’re into geometric shapes and it’s also unique! Price: Rs 5,280. Buy it here. MUST-READ: 8 Gorgeous Shoes Made For Dancing (& Not For Ouch!) MUST-READ: 8 Super Pretty Clutches For The Bride’s Trousseau!